how can i see the recipe ? In the above steamed moist chocolate cake post, there is a link to the recipe on the second paragraph (high lighted). 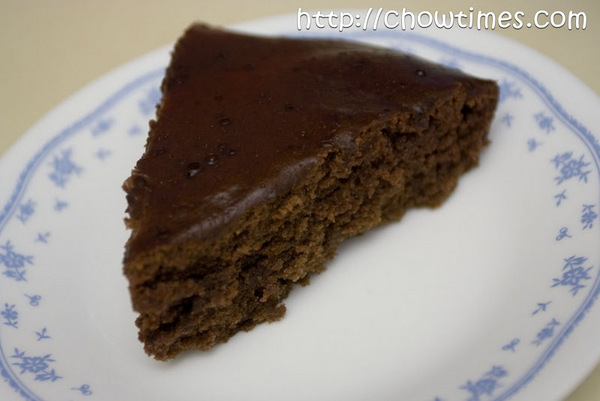 hi!i really want to try this recipe of yours(steamed moist chocolate cake)..can you send me your recipe?thanks very much! Hi Mummy’s Kitchen, it’s hard to pin point what went wrong. I tend to use less baking powder for the steamed banana cake and it will turn out not as fluffy. Other than that, I have no problem with the recipe. Hi zoe, the recipe for the steam version is the same as the baked version. I only used half of the recipe for the steam version. This is because the size of my steamer can only accommodate half of the recipe. hi..i.ve go trough yr eggless moist choclate cakes resepi…& it’s looks yummy..can i subtitude white vineger wt lemon/lime juice…?? ?or do hav any idea wat is the bes to replace vinegar..non achoholic.& why the colour different betwenn baked & steamed..TQ for your help..
Hi xie, you can substitute white vinegar with lemon juice. I do not know why there is a difference in color between baked and steamed. Hi there, this cake is not like sponge cake which is very airy. It’s kind of slightly dense and moist. Hi Jen, if you read back the comments on this post, there were several times the cracking question was brought up. Perhaps, you can try steaming the cake with lower heat and steam is a bit longer. I am steaming the cake as I type this. Instead of putting it in a steaming tray, I make it into cupcake & steam using a electric steamer. It cracked even though it’s still not cook yet. Taste wise is perfect. Any way to prevent crack. Thanks for taking the trouble and mailing the link. I really appreciate your help. I AM new to your blog and tried your egg less moist cake recipe in the oven. It was a hit. Absolutely delicious. I passed your recipe link to many of my friends. I also wanted to know that, is it possible to make the steamed chocolate cake/banana cake in the Indian version of pressure cooker as I don’t have Bamboo steamers. If so, what is the maximum time I am supposed to steam it. I would appreciate your suggestion on this and can pass the suggestions to my mom as she does not have an oven is an vegan. Hi cake lover, I checked with Karen, a personal chef yesterday on your question. Karen said the vinegar should not make any difference. If you follow the recipe strictly like not reducing the oil which will cause the cake to be dry, the most likely reason is that the oven temperature is too hot. Are you using a dark or glass pan? If so, reduce the oven temperature by 25 degrees. Also, check your oven temperature with an oven thermometer. Sometimes, the temperature is not what you have set. Try not to open the oven door before the cake is done as this may cause the cake to crack, especially chocolate cake. Hope this help. I came across your chocolate cake recipe while surfing for steamed cakes. I’ve never baked before; I don’t even have a conventional oven. So this is my first dab at baking. I tried the recipe, and just finished it. I’m so happy to report to you that the steamed moist choco cake turned out wonderful (I used half of the recipe)!! I have substituted the 1-3/4 cup icing sugar. I made it this morning and brought it at work. My colleagues loved it! But just one tiny little thing.. the cake cracked in the middle 😦 it’s not as flat and smooth as your steamed cake in the photo. But its just a minor thing. The taste is more important. I sliced the cake before I brought it at work so they wont notice hahaha. Hi bridges, the most likely reason the cake cracks is too much heat. Try cutting down the steaming time by 5 minutes. Do a doneness test with a toothpick after 25 minutes. I would like to try the steaming method. Can I replace the sugar with icing sugar? Hi bridges, I’m sure you can substitute granulated sugar with icing sugar. The substitution formula is 1 cup of granulated sugar = 1 3/4 cup icing sugar. I would love to know how it turns out. can I use baking powder instead of baking soda for steamed Moist Chocolate Cake? Hi Allyson, someone ask the same question and I have the answer in the comments of the Moist Chocolate Cake post. There is no direct substitution formula for baking soda with baking powder, it’s much easier to get a box of baking soda. Hi Rose khan, you can find the recipe at link to the Moist Chocolate Cake. Hi Mira, you can certainly use a mixer to do the job. Hi Suanne, I’d like to ask if by “mix” you mean strictly by hand, or can I use the mixer? It’ll be faster to dissolve sugar with mixer, right? Hi Angela, if you click on the link of Moist Chocolate Cake, you’ll see the recipe and I used half of the amount for the steamed version. 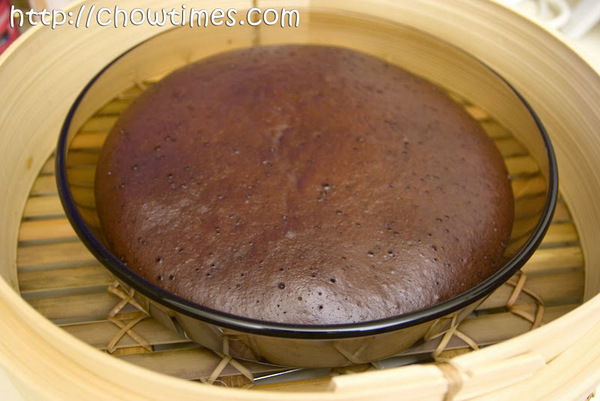 I love the picture of the STEAMED MOIST CHOCOLATE CAKE . I would like to have the recipe. Could you please email to me the recipe? So that I can try to steam the cake. Hi shadowy_world, I find that bamboo steamer which is the same size as the wok or pot is more practical, especially if you are going to get a large bamboo steamer. I don’t think you can find any wok with a cover which can totally encase a 12″ or 14″ bamboo steamer. Anyway, bamboo steamer comes with it’s own cover. Thanks a lot, Suanne. So we choose the bamboo steamer and the wok that have the same size, supposing I’m going to buy them separately? I want to make sure about this because I’ve read somewhere that the bamboo steamer is supposed to be smaller than the wok. Btw, I’m really sorry for misspelling your name last time. My bad! Hi Shadowy_world, I know they come in 14″, 12″ and smaller size. To me, it has to be at least 12″ for practicality. I have a 14″ bamboo steamer because I have a 14″ wok. I’m new to the cooking world but I like steamed food a lot. Thus, I’m going to invest in a good wok and a set of bamboo steamers but not sure what size they should be. How can we choose the bamboo steamer so that it can fit into a wok or a deep pot? I’m going to buy those things online so if you could suggest some sizes (diameters) for example, that would be great. Thanks a lot! I tried the previous recipe and it turned out to be great. Have you ever tried this with carob instead of chocolate? If you want to know of a great place to buy carob, you can try Holy Food Imports (www.holyfoodimports.com). Their products are produced in the holy lands of Israel and sold in the US so they are high quality.